Florida Gulf Coast University offers a wide variety of Academic Resources and Special Programs designed to provide students with opportunities for academic assistance as well as for growth and leadership. Academic resources include the Writing Center, a center offering one-on-one tutoring to help students improve their knowledge of writing strategies; and the Center for Academic Achievement, a center offering numerous programs which provide students with supplemental instruction services, tutor-facilitated learning labs, and workshops. Another academic resource, the Degree Evaluation program, is an online advising tool that allows students, in conjunction with their advisors, to evaluate course work against degree requirements. Special programs include the Honors Program, a program involving collaboration between advanced students and faculty mentors working together to develop challenging programs that support students’ goals; and Service Learning Eagles – Connect, a program that encourages community responsibility while fulfilling a university requirement for graduation. 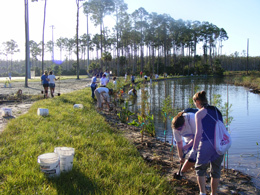 Another special program, University Colloquium, is a required interdisciplinary environmental education course, designed to explore the concept of sustainability as it relates to a variety of considerations and forces in Southwest Florida.